500 сольфеджио. Пособие к развитию музыкального слуха и чувства ритма. Ноты. 2-е изд., испр. Пособие адресовано учащимся детских школ искусств, а также для исполнительских специальностей ссузов. Будет полезно всем любителям, осваивающим профессию музыканта. Nikolai Sergeevich Potolovskiy (1878–1927) was a Russian musicologist, theoretician and composer. 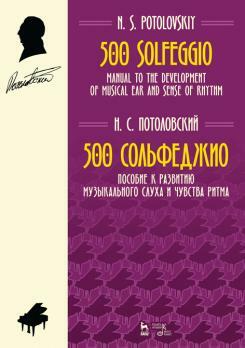 The collection «500 solfeggio» is a guide for the development of musical ear and sense of rhythm. The publication consists of two parts: simple and complex (as well as twice complex) measures or sizes. The sections of the first part are arranged in order of increasing intervals (from a second to an octave, and their conversion). At the end of each part, the numbers for the repetition of the material are presented. The manual is addressed to students of children’s art schools, as well as for performing specialties of secondary schools. It will be useful for all amateurs who master the musician’s profession.